The Plain of Jars is an area with over 300 giant jars of unknown origin that vary in size from 2.5 to 11 meters in height. Pimai (pee-my), the Lao New Year, is the country’s most important holiday. The 3 day festivities take place in mid-April and consists of washing Buddha statues. 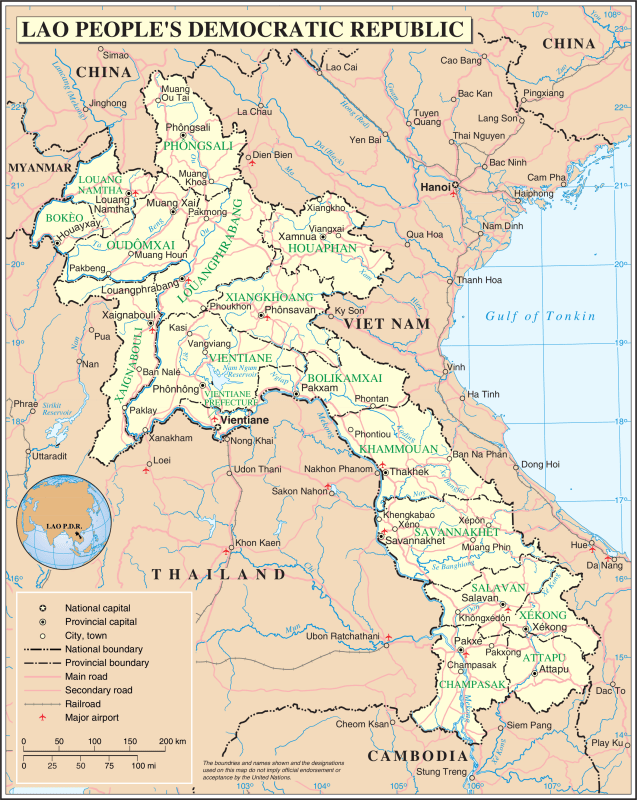 Laos has been tagged as the “World’s Most Bombed Country.” Thousands of live ordinances are still active in the ground from the Vietnam War. Laos is a very poor country. Most people don’t have electricity or running water. Lao BBQ is an arrangement of meats (raw) and a mini-hibachi and sauces. Delicious! Bia Lao - Lao Beer is some of the best in the world! LaoLao (rice liquor) is widely sipped and stay away from the brown variety. The plain of Jars is one of the weirdest places we have visited. The ViangXai Caves are very interesting in the North East and give a rich history from a different perspective on the Vietnam War. Vang Vieng is one of the most beautiful places we have been. Do the river tubing if they are still doing it. The Blue Lagoon and Cave or Buddhist Full Moon Festival – Decisions, Decisions! Nam Song River Tubing in Vang Vieng, Laos Isn’t Dead Yet!